Bembibre: the best rated wine of Bierzo by The World of Fine Wine - Dominio de Tares | Dominio de Tares es una bodega de vanguardia en la Denominación de Origen Bierzo. 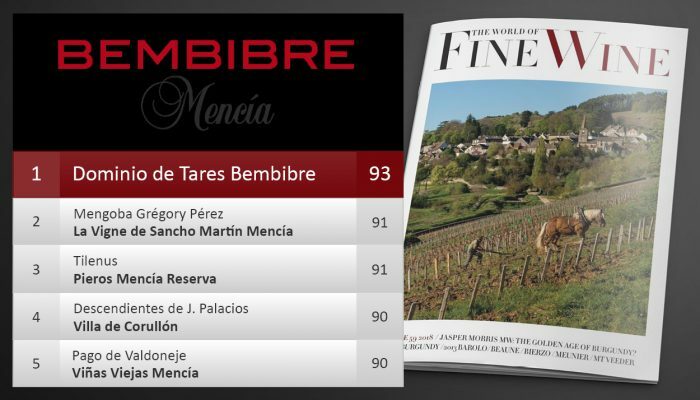 The prestigious British publication The World of Fine Wine has highlighted in a blind tasting Bembibre amongst the wines of the Bierzo region. This magazine is an international reference because of its renowned critics (written, amongst others, by Decanter columnists and Masters of Wine) and because of its worldwide diffusion with subscribers extending across 30 countries. Andrew Jefford was joined by Jesús Barquín and Richard Mayson for the tasting and in the words of Mr. Jefford, Bembibre is “Another wine where Bierzo almost seems to strike Bordeaux. Absolutely nothing at all missing: fruit, tannin, mineral notes, warmth and freshness alike. It’s all here. Bravo!”. Bembibre, since the first vintage in the year 2001, is made with the best grapes sourced from six 80 year-old plots, with an ageing of 16 months in barrels plus an additional 24 months in bottle after.